Our Endless Numbered Days, by Claire Fuller, for a novel of ambiguity that is more than open to readers' interpretations. The Widow, by Fiona Barton, for a psychological thriller that explores the question of how well we truly know the ones we love (my review of The Widow and interview with Fiona Barton). Little Black Lies, by Sharon Bolton, for a psychological suspense story that probes the depths of a parents' love (my review of Little Black Lies and interview with Sharon Bolton). The Cutting Season, by Attica Locke, for an excellent, suspenseful murder mystery that delves into how far a parent will go to protect his or her child as well as the ways past crimes interact with current ones. 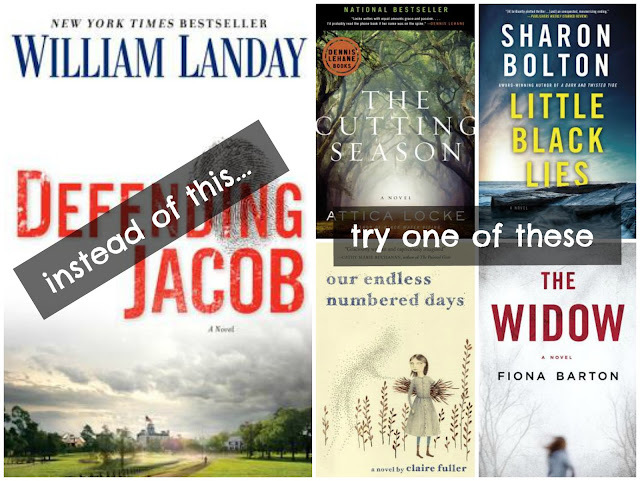 If you or your book club read Defending Jacob, what did you think of it? And what else might you recommend to book clubs considering it?